The numbers illustrate the extreme financial challenges of home ownership on a tropical island paradise: the median home in Hawaii costs $605,000, nearly $100,000 more than a comparable house in San Diego. R.J. Martin ’01 (BA) is hoping to do his small part to bring relief to island dwellers, whose residents, due to their isolation, also pay nearly 30 percent more on household items than does the rest of the country. Over the past nine years, Martin has developed Green Homes at Lualualei, a community of 25 energy-efficient homes reserved for first-time home buyers who meet HUD affordability requirements. The last residents moved into the homes, some of which overlook Oahu’s Ulehawa Beach Park, in September. By year’s end, he’s planning to bring to market three more homes that will get electricity through Tesla’s Powerwall, a rechargeable lithium ion battery. Building his development has been challenging. Hawaii, Martin says, has done little to encourage new home construction. Further, the state lags behind the rest of the nation in encouraging sustainability, he adds. 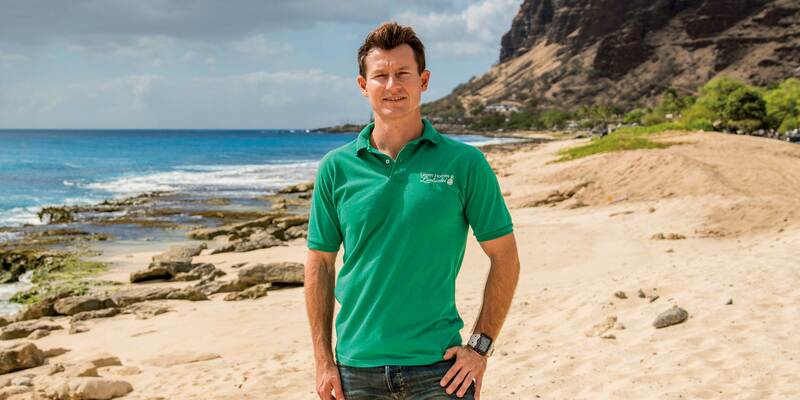 Martin has battled to make Green Homes at Lualualei a reality. Due to the state’s construction challenges, he was turned down for a $2 million loan from the Hawaii Housing Finance and Development Corp., which is charged with creating affordable housing. He also was rejected by numerous banks. Martin pursued the project only after promising contractors that he’d pay them later. Green Homes at Lualualei were priced between $250,000 and $328,000 for two- and three-bedroom dwellings. Larger models topped out at $456,000. Martin bought the 3-acre parcel from equity he earned from selling his previous Ewa Beach home. Investors helped with additional costs. The neighborhood, with help from its residents, is dotted with native plants. It’s a paradise of Martin’s own making. He earned a doctorate in American history from the University of Hawaii at Manoa, and has since taught world history at the University of Hawaii at West Oahu. But real estate has never been far from his mind. Martin is the son of two public school teachers; his father also was a Realtor. “I see the world around us in terms of real estate and values and construction,” he says. It was at USD where Martin, an English major, developed new ways of thinking about the planet he walks. He took an environmental ethics class from Mark Woods, associate professor of philosophy, who left his protégé questioning his place in the world. For Martin, developing affordable homes has become less about making money than doing what is right.